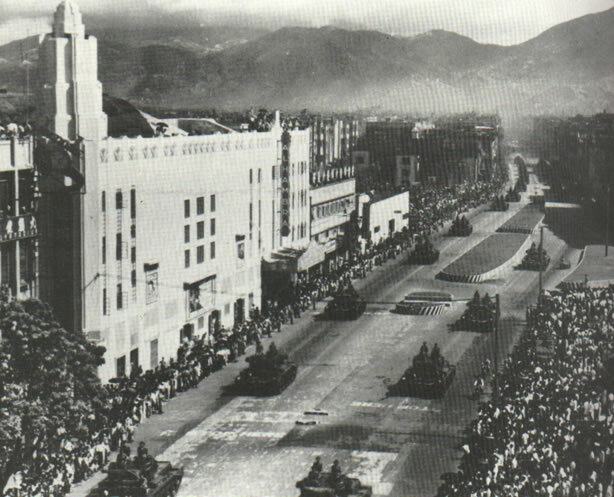 As noted in the previous Chapter the Seventh had been sent to the Chinese mainland in November 1951. 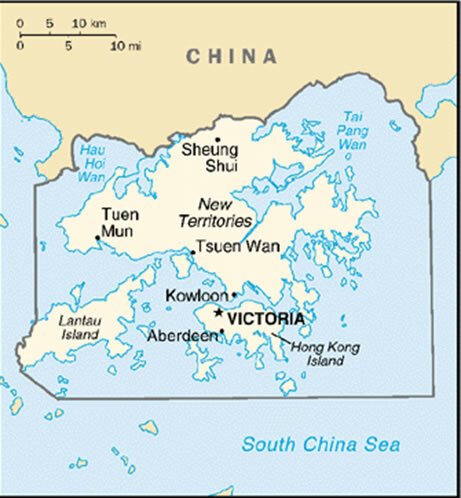 They were not in the Kowloon/Hong Kong area, seen here, but in the North of the New Territories at Sek Kong. 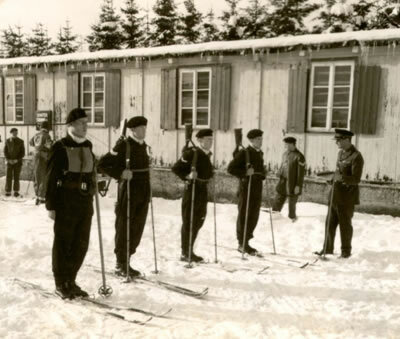 The regiment regularly undertook border patrols and there was much opportunity for challenging adventure training, but operationally it was an entirely uneventful two year deployment; the contrast was especially enjoyed by members of C Sqn who had so recently been heavily engaged in the Korean war. 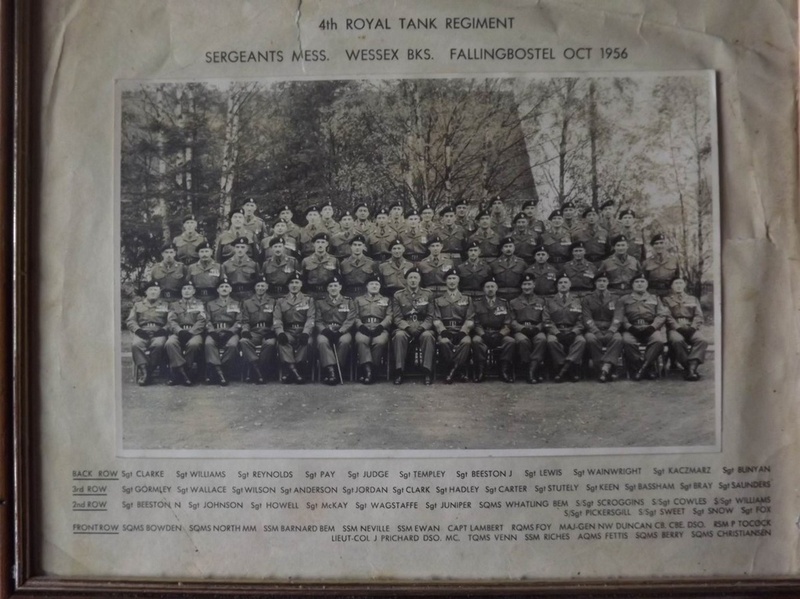 Centre Row 2/Lt Davies, Lt Col Mike Woollcombe DSO. 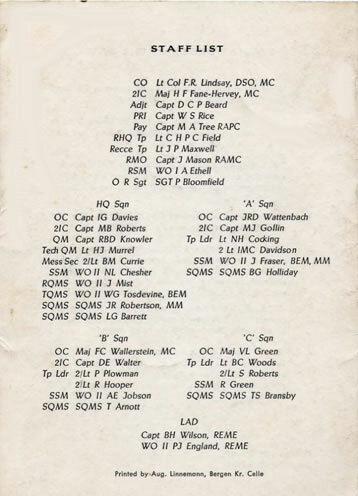 OBE., 2/Lt Reeve, Maj N Payne-Johnson, ? 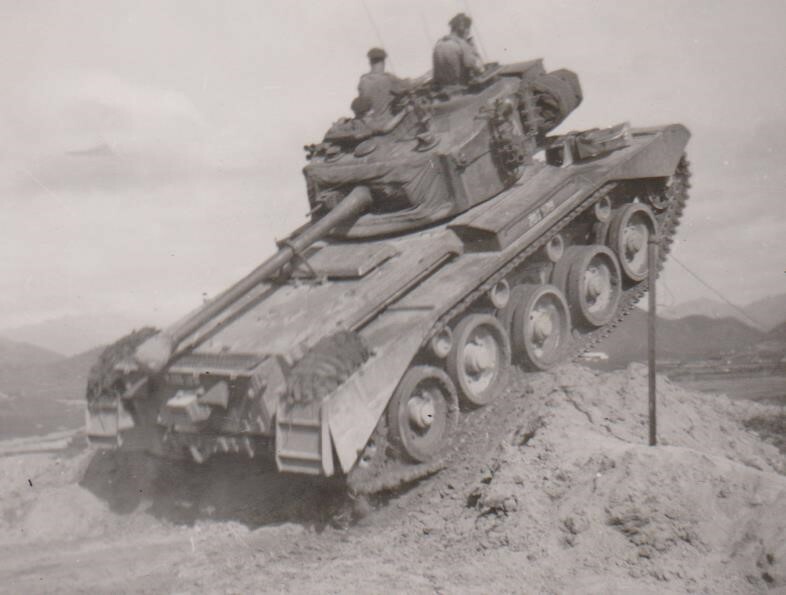 The Comets were the oldest main battle tanks in service and took some nursing. 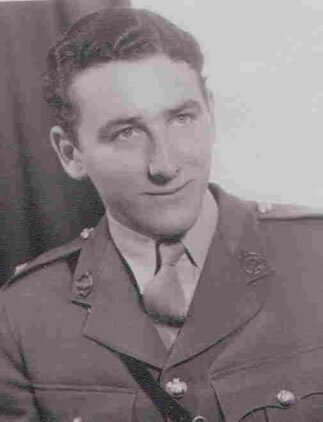 The Comet had a crew of 5, Commander, gunner, loader operator, driver and lap gunner. 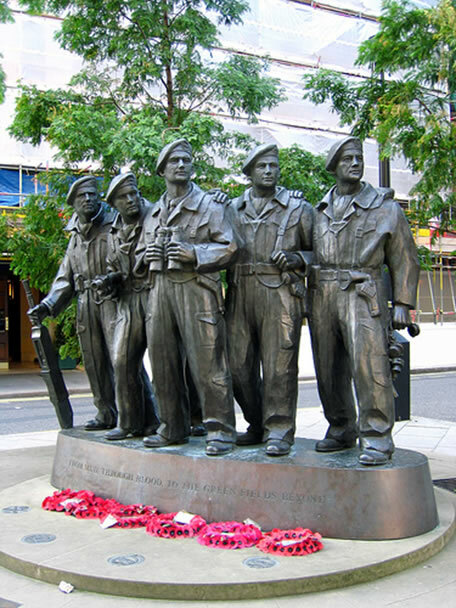 The RTR memorial in Whitehall immortalises them. 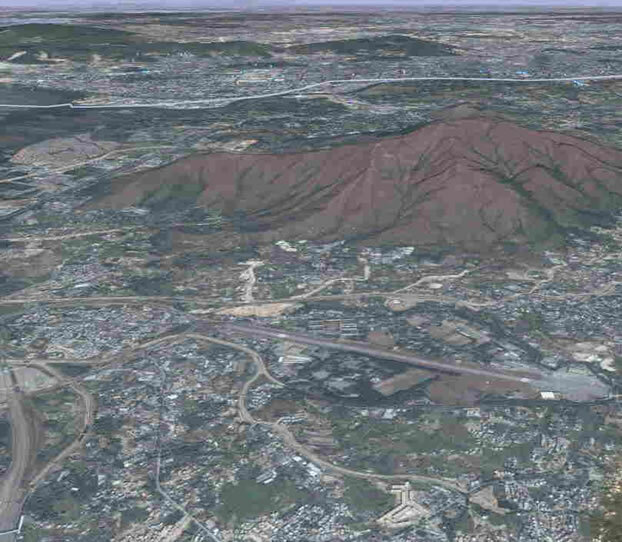 The Hong Kong training area was small and limited but not without its hazards ! 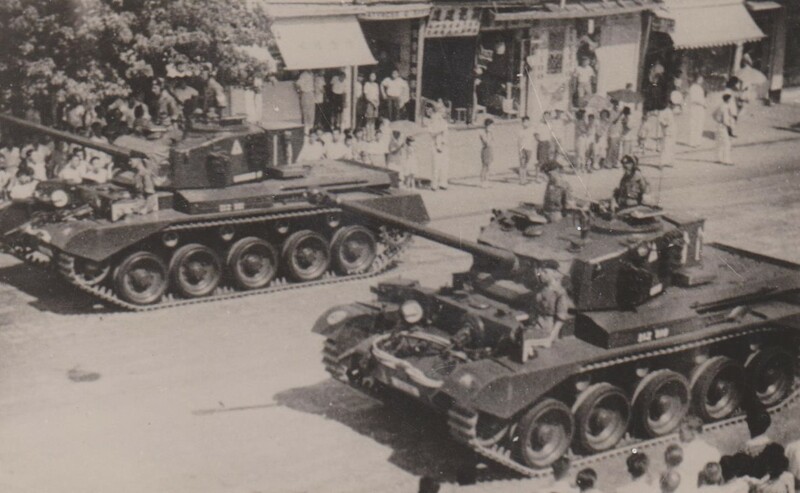 In the early hours of 1 June 1953, while it was still cool and before the newly-laid surface warmed up, 7 RTR moved across Route Tun Wan – Sek Kong (TWISK) to take part in the Coronation Parade in Kowloon. 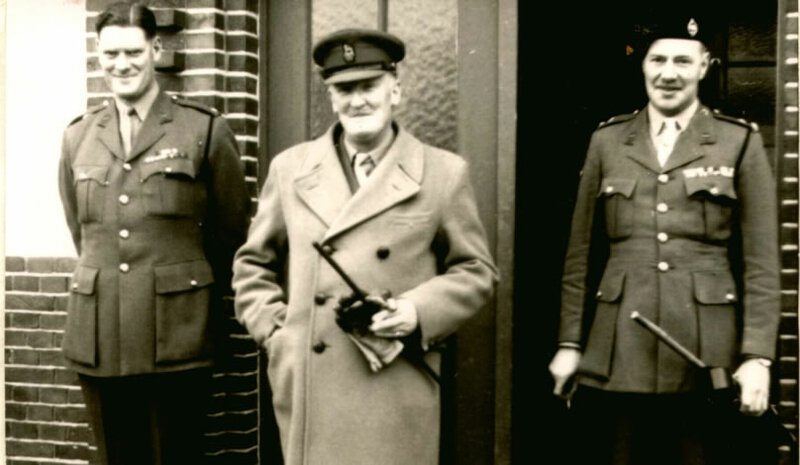 This is Major Arthur Crickmay MC leading C Sqn. 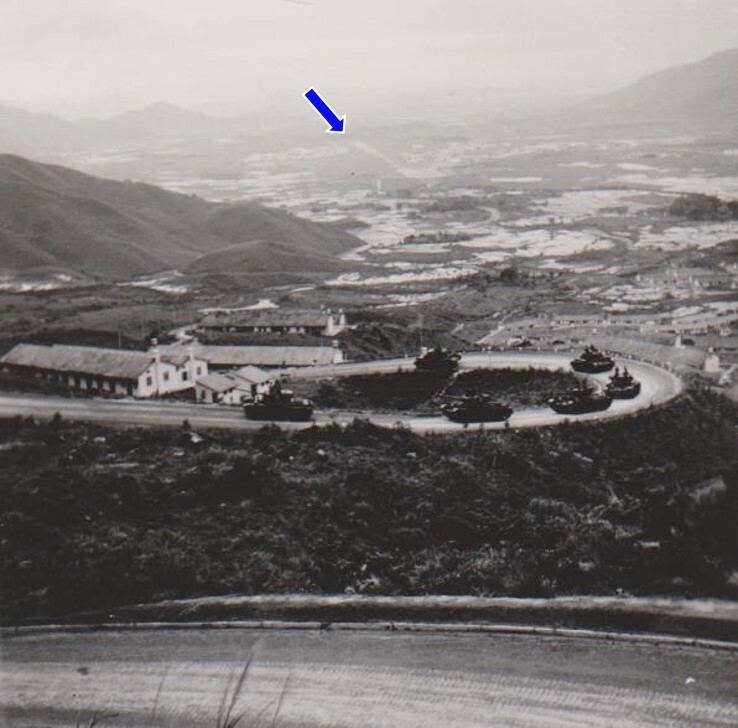 As the Regiment climbs out of the Sek Kong valley over Route TWISK we could look back on our base. 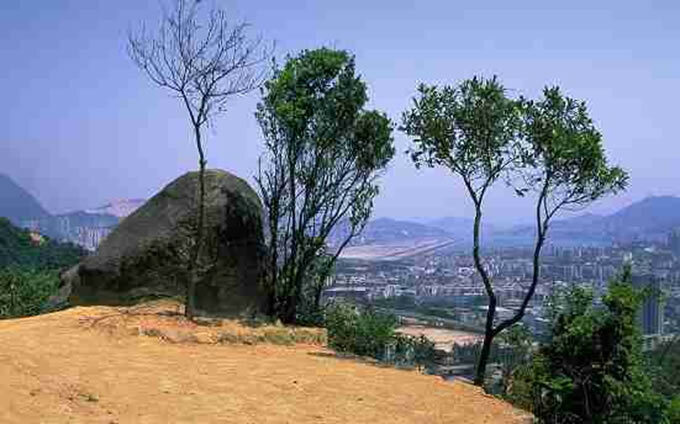 The operational air strip around which the Regimental camp was built, can be seen in the middle distance (arrowed). 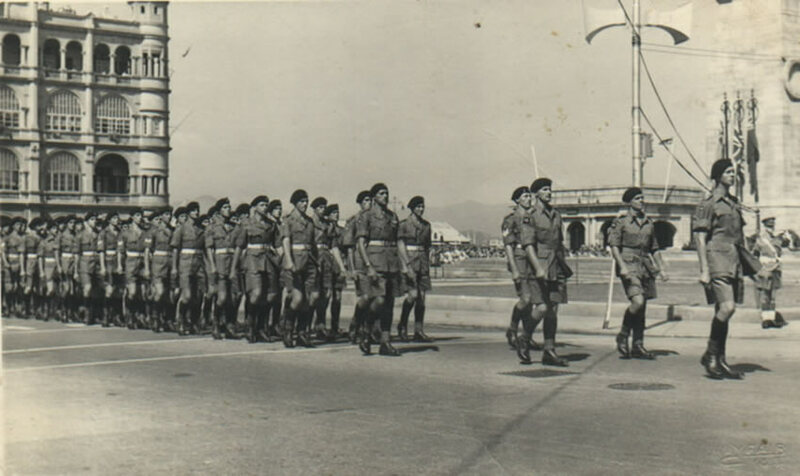 The Regiment drove through Kowloon on Tuesday 2 June 1953 as part of the Coronation celebrations. A Sqn Comets approach the Drive Past on 2 June 1953. Preparing to traverse turrets and dip guns in salute to His Excellency The Governor, Sir Alexander Grantham . 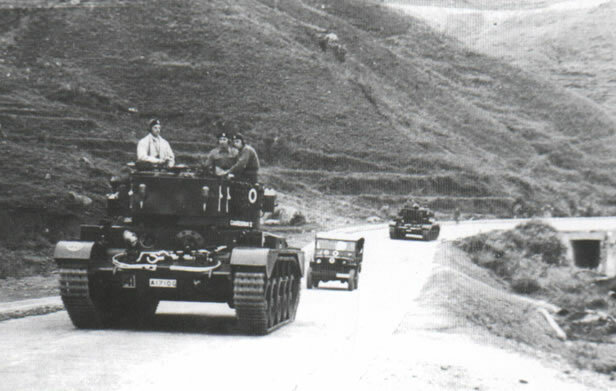 Tp Ldr 11 Tp C Sqn 7 RTR (2/lt New) in “Gamester” salutes the Governor of Hong Kong during the Drive Past. 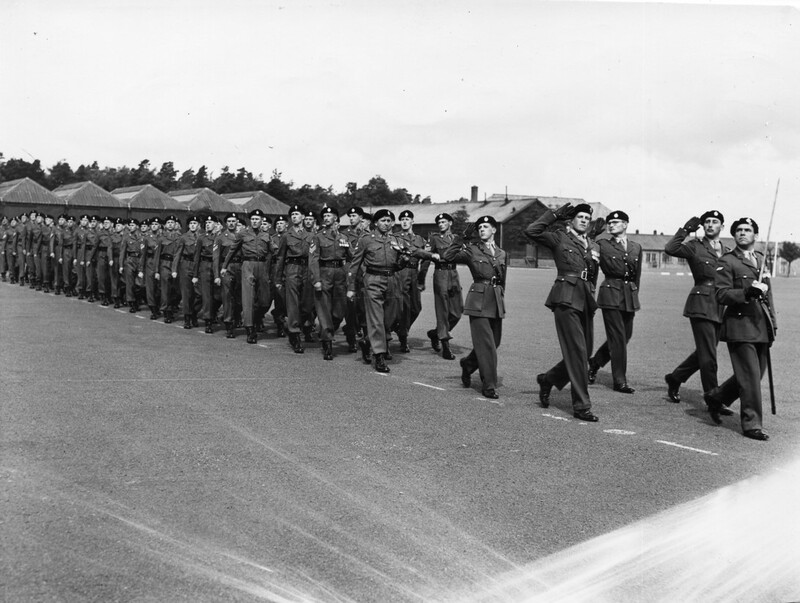 Part of the Coronation Celebrations involved the Regiment parading on foot. The Regiment’s 2IC, Major (later Lt Col) R G Saunders and his family together with a junior subaltern, 2/Lt L.A.W.New, embarked on the Empire Windrush in February to return to the UK ahead of the Regiment’s deployment to Catterick in September. 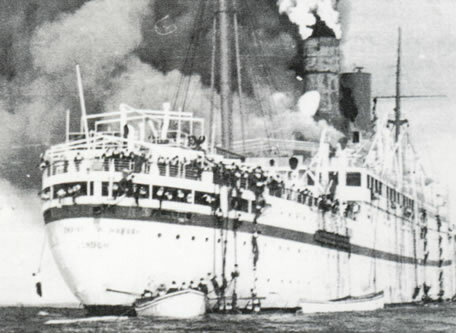 At 0617 on 27 March, thirty two miles North West of Algiers, there was a massive fuel fire in the engine room and by 0700 ten of the ships twenty two life boats were already destroyed or had to be pushed overboard because there was no power to lower them. 700 women and children and 570 troops were safely evacuated in the remaining boats but 130 men, mostly officers, had to swim. The author swam in shantung silk pyjamas without a life jacket ! It was an interesting introduction to crisis management! 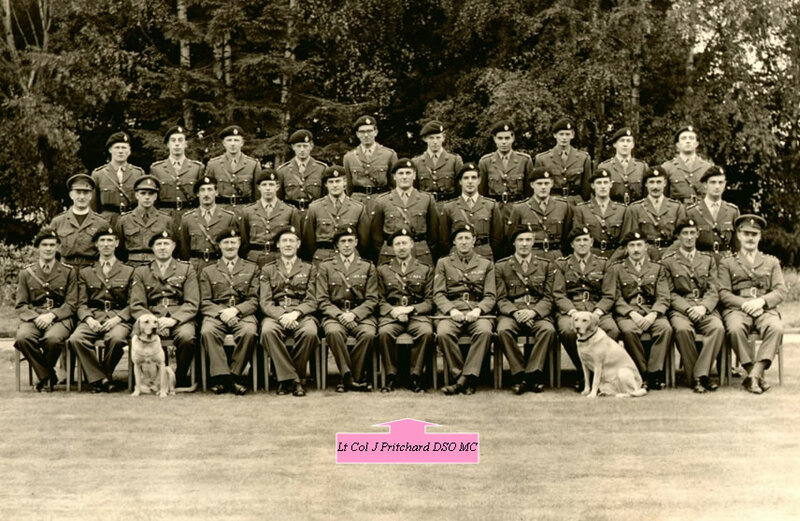 Front Row ?, L/Cpl McLeod, Lt Col J K Greenwood OBE , L/Cpl McLeod (junior twin by a few moments), ? 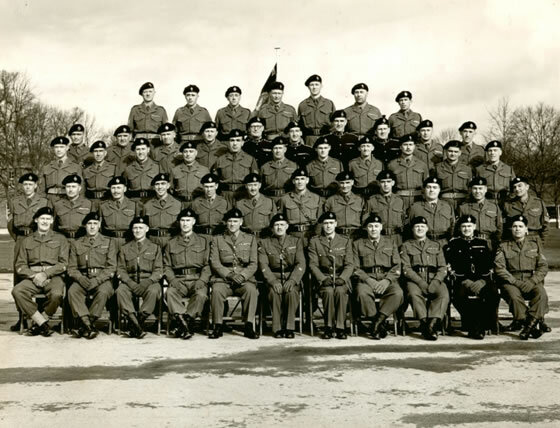 The WOs and Sgts 4 RTR Tidworth February 1954. 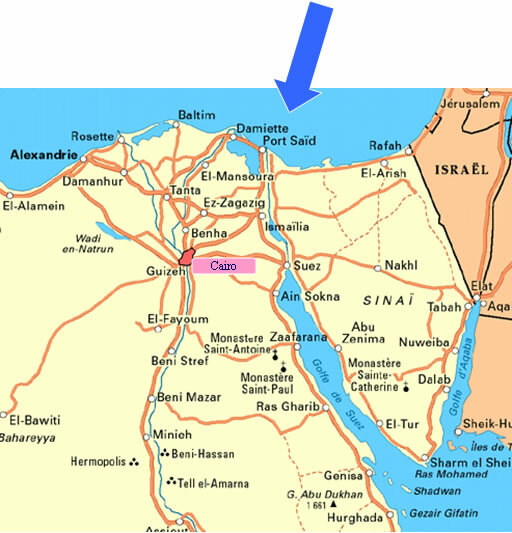 In early July 1956 President Nasser seized control of the British-owned Suez Canal. On 27 July Sir Anthony Eden, working in overt co-operation with the French Government and in covert co-operation with Israel, ordered preparation for intervention. 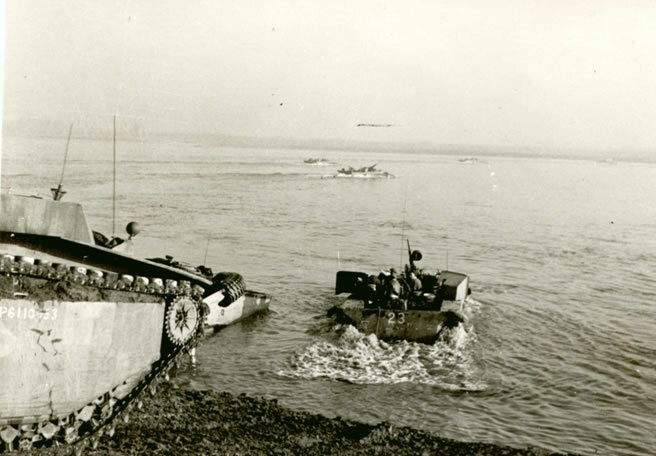 Captain Peter Berry, 7 RTR, together with a 32-man team, was ordered to report within 12 hours to the School of Amphibious Warfare where they were to form No 1 Landing Vehicle Troop RAC. 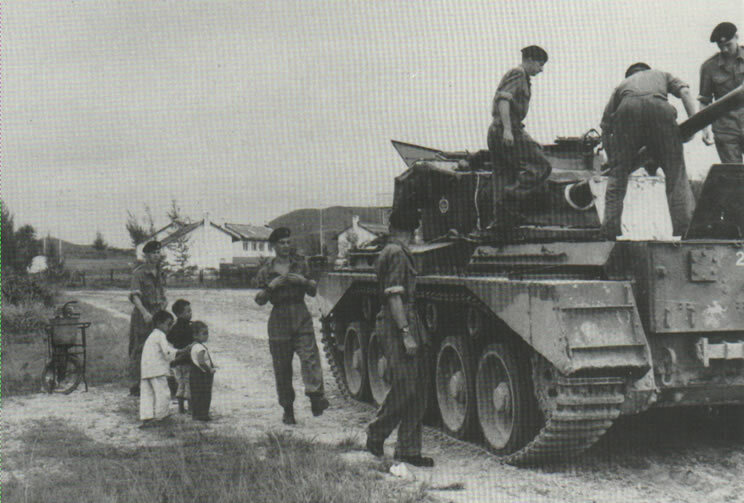 They were trained to operate LVT Mk IIIs similar to the Buffalo used by 4 RTR for the Rhine Crossing. 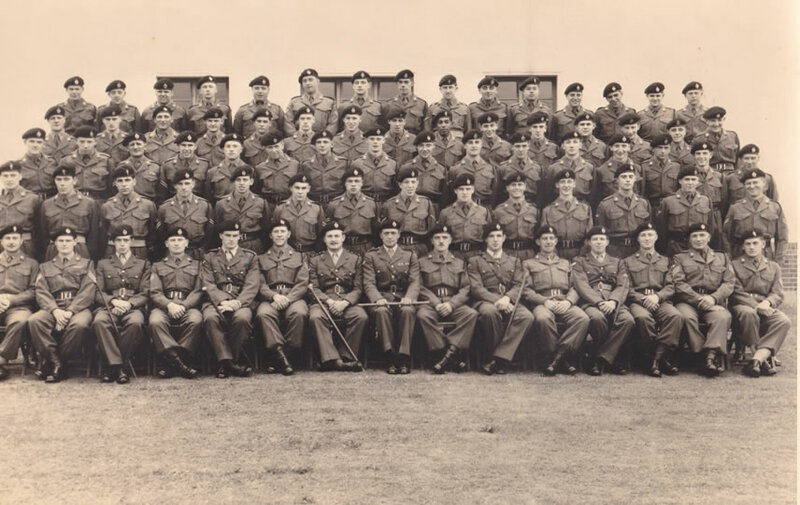 They and the LVTs were flown and shipped to Malta where they trained extensively with 45 Commando RM, who would be neighbours in Little Aden in 1964. 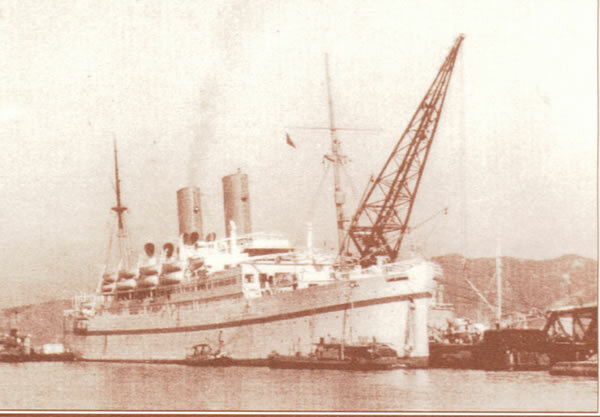 At 0415 hrs on 6 November Captain Berry and his LVT Troop swam ashore at Port Said carrying 40 and 42 Cdo RM. It was an opposed landing but Egyptian machine gun nests were quickly silenced. 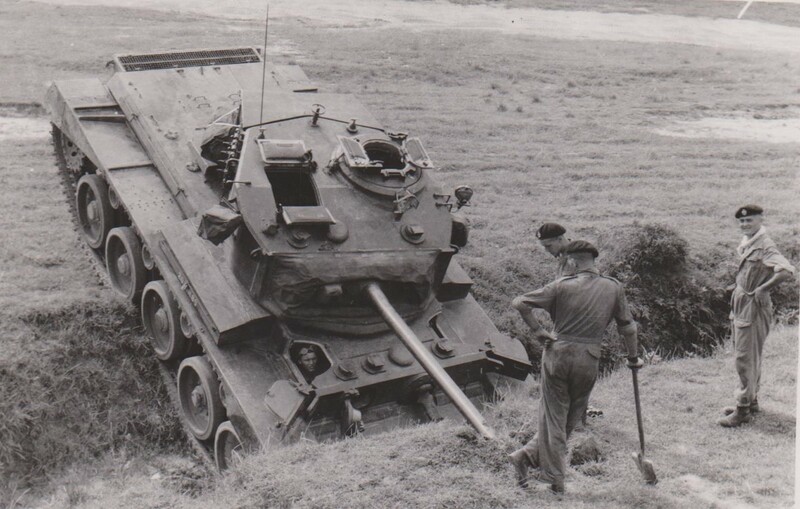 As they moved into the town the LVTs began to take casualties among the marines and the LVT crews. One sergeant 7 RTR was killed at this point. Twenty minutes later C Sqn 6 RTR (Major John Jolly) came ashore. 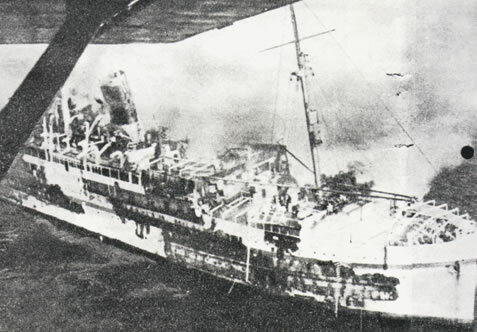 Naval gunfire was effective, Royal Marine commandos were landed by helicopter and the combined force quickly reached their initial objectives within the Port Said complex. The force was now strengthened by two sqns 6 RTR . 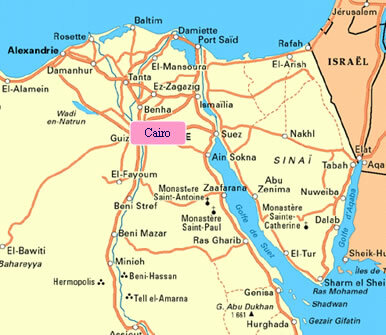 Sadly the order to halt was given before the leading elements reached Ismailiya. The UK bowed to American-led World pressure to halt “Operation Muskateer”. 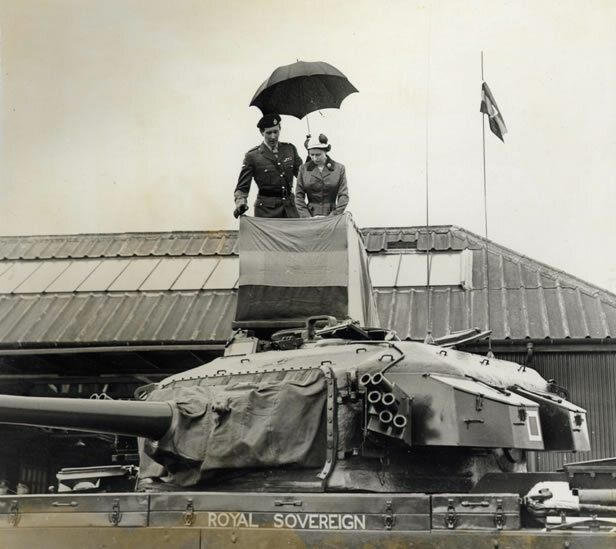 Sir Anthony Eden resigned and the troops returned somewhat deflated to their UK tasks. 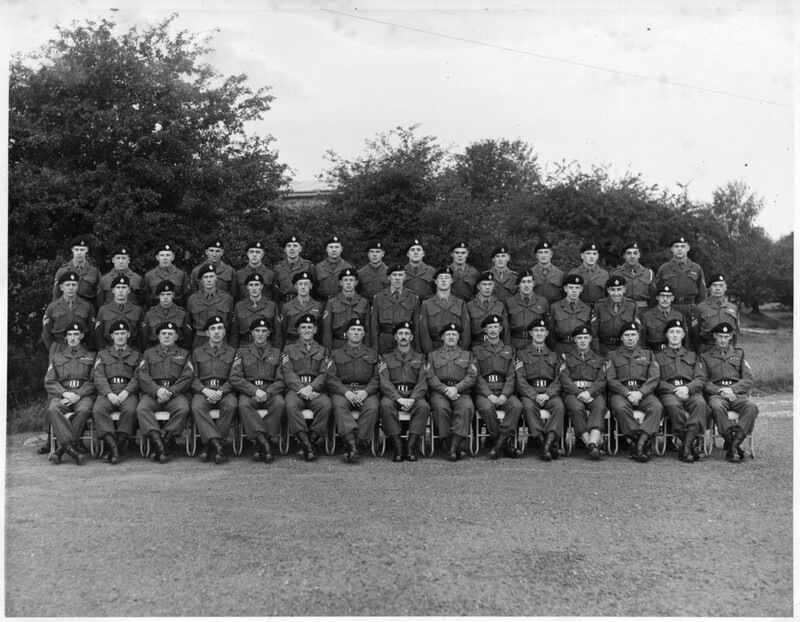 Meantime the Seventh were established in Catterick as the RAC Training Regiment. 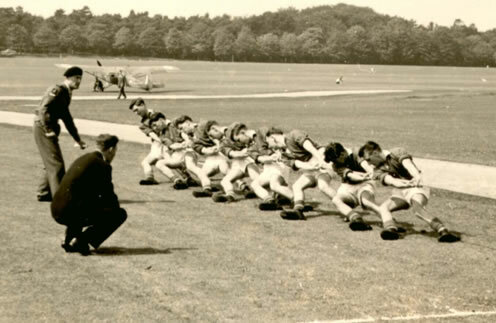 Sport was an important antidote to low morale in the Army generally and to a regiment in the training role in particular. 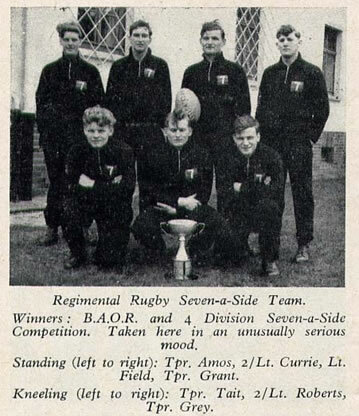 The Seventh had a very successful football team… …And a good Rugby fifteen. NCOs C Sqn 7th RTR, Catterick August 1956. Lamb, Prendergast, Guest, Jones, Cpl Selvage, LCpl Francis. Dennis, Kidd, Roberts, Cpls Hodges, Price, Sgt Holliday. SSgt Donaldson, SQMS Gaunt, SSgt Arnott, Sgts Barratt, Morris, Lewis, Smythe, Compton, Lane. 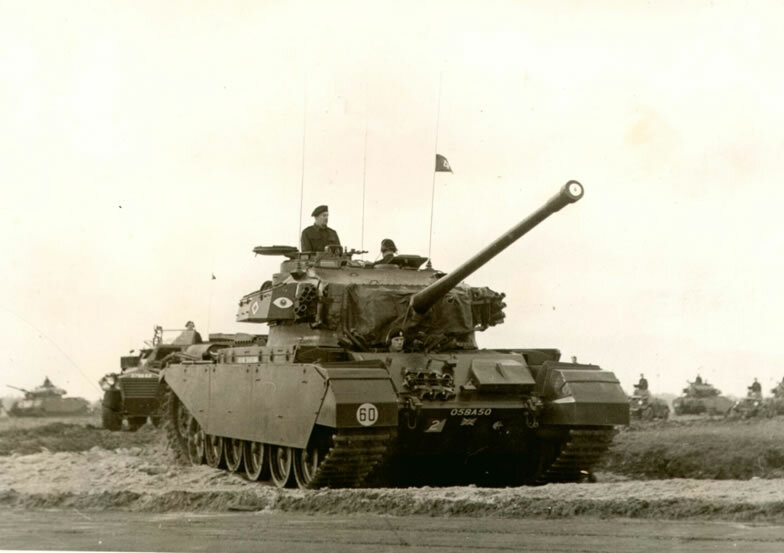 C Squadron 7th RTR, Catterick Camp, summer 1957. Sgt Lane, SSM D Millett, Sgt Barratt. 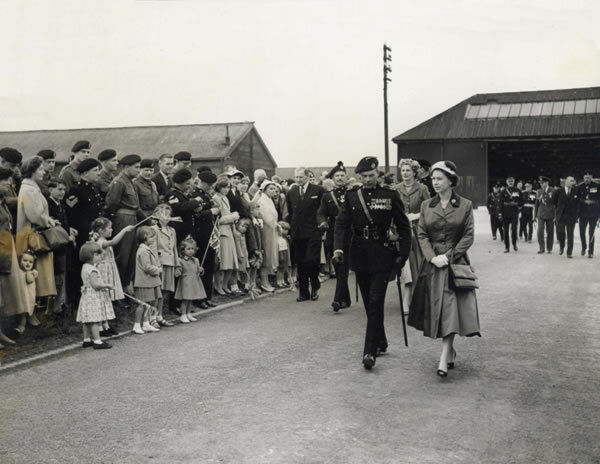 On 10 July 1957 HM the Queen visited 7 RTR in Catterick. 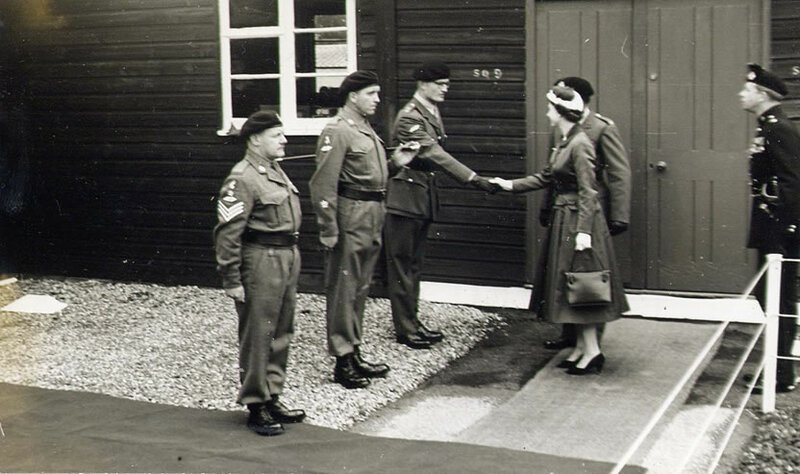 It was her first visit to an RTR Regiment since becoming our Colonel-in-Chief. 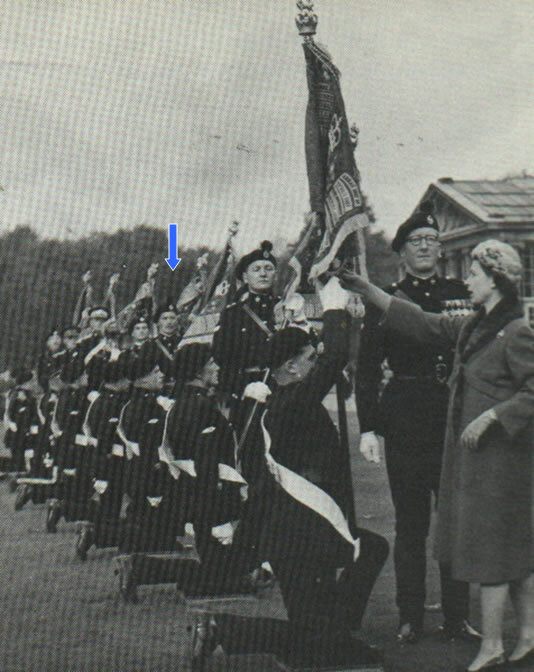 Here she is escorted by the Commanding Officer, Lt Col F R Lindsay DSO MC. Accompanying the Lady in Waiting is the 2IC Major A.Crickmay MC. Captain J D F Alexander escorts the Colonel-in-Chief as she inspects the Guard of Honour. Major F.C.Wallerstein MC gives Her Majesty an aerial view of the newly named Royal Sovereign. S/Sgt Arnott, SSM Millet, Lt C H P C Field and Major V L Green (obscured by HMQ). The Commanding Officer, Lt Col Bob Lindsay DSO MC. Bids the Queen farewell. 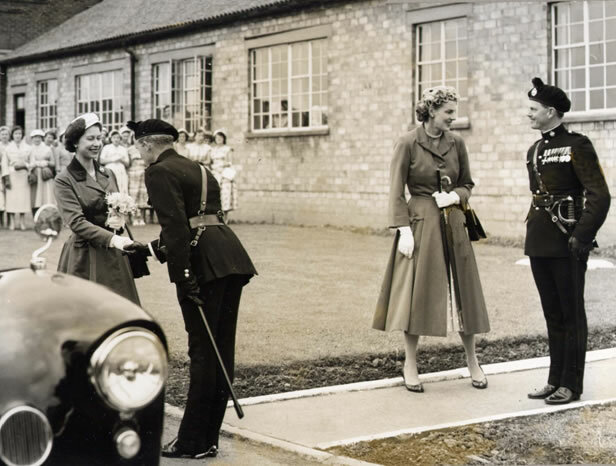 Major Arthur Crickmay MC bids farewell to the Lady-in-Waiting. The Colonel Commandant, Major General Nigel Duncan CB,CBE, DSO, the CO and the 2IC watch Her Majesty drive off with perhaps a small sigh of relief! 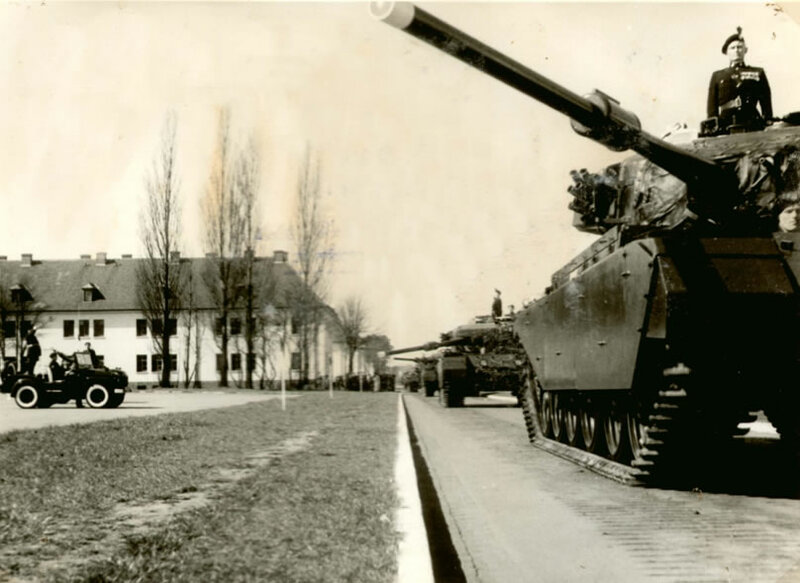 In October 1957 the Seventh moved to Hohne in preparation for amalgamation with 4 RTR. Every effort was made to think positively and it was appreciated that the pairing was logical. 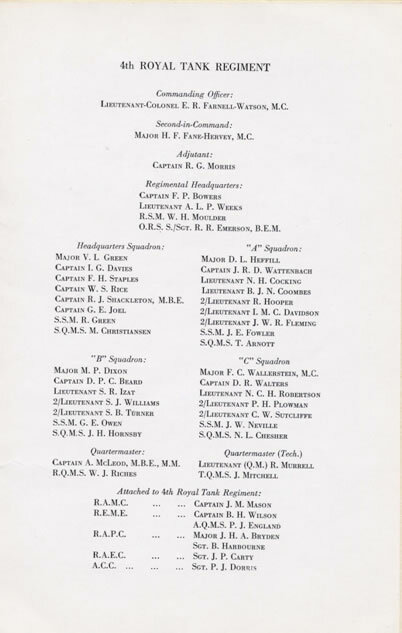 7 RTR had been formed out of 4 RTR in 1937, they had fought together many times in both World Wars and had died together in Arras and Tobruk. 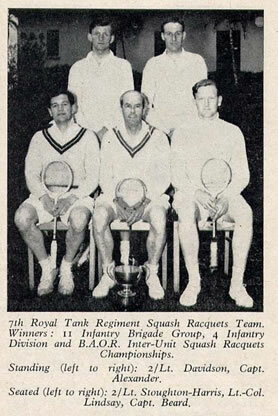 In those last months before amalgamation the Seventh won the Sevens and Squash BAOR Championships. Part of the prize for the squash team was to play the Danish National Squad. Arriving in Copenhagen the night before the match they were royally entertained by players posing as the opposition . On the day the real Danish national squad, without hangovers, won!! 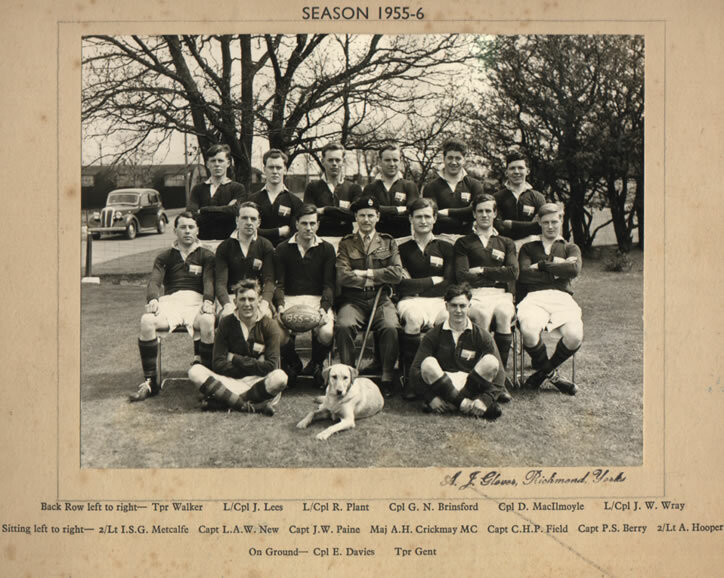 The Seventh had an extraordinary soccer team by this stage including fourteen professional footballers – National Servicemen who had been successfully encouraged to join the Seventh on completion of their basic training at Catterick! 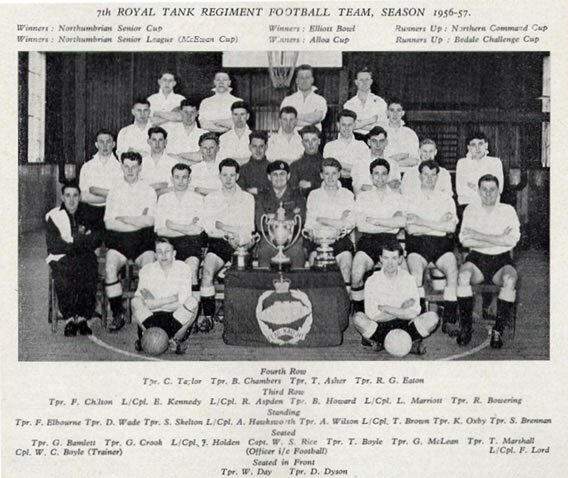 In Army Cup competitions a regiment could only field a maximum of three such players so the Soccer officer, Captain Bill Rice, formed a professional team as well. 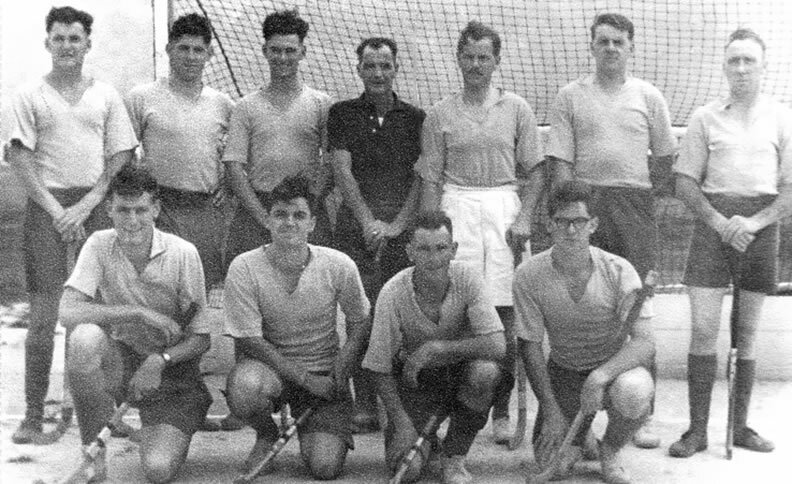 They played against several of the German 1st division clubs, including Hamburg and Hanover. The German clubs paid a percentage of the gate money to the PRI. As a result the Seventh reckoned to have the richest PRI in the Army! The hockey team was good but not quite in that league! Meanwhile the Fourth, were stationed in Fallingbostel, Western Germany. 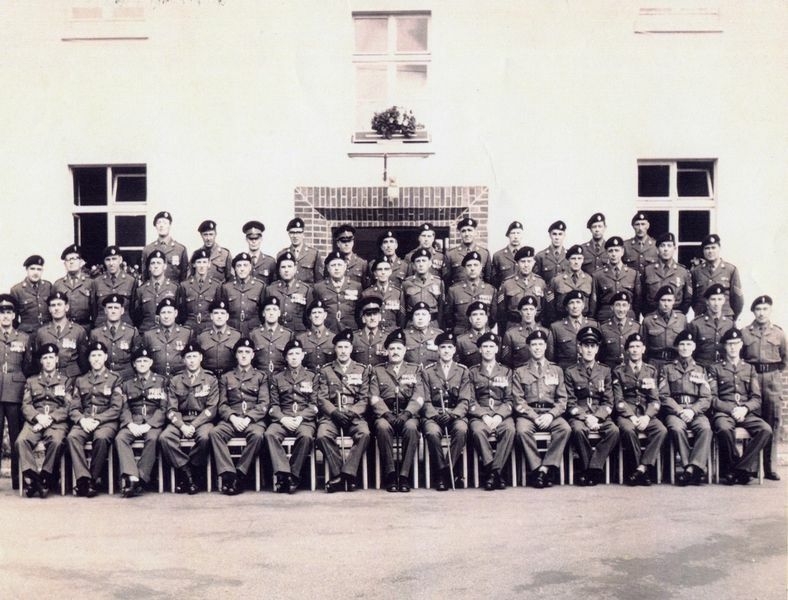 Here we see the Warrant Officers and Sergeants Mess 1956, centre front row left to right Maj Gen Nigel Duncan, RSM Tocock and Lt Col Jack Pritchard . 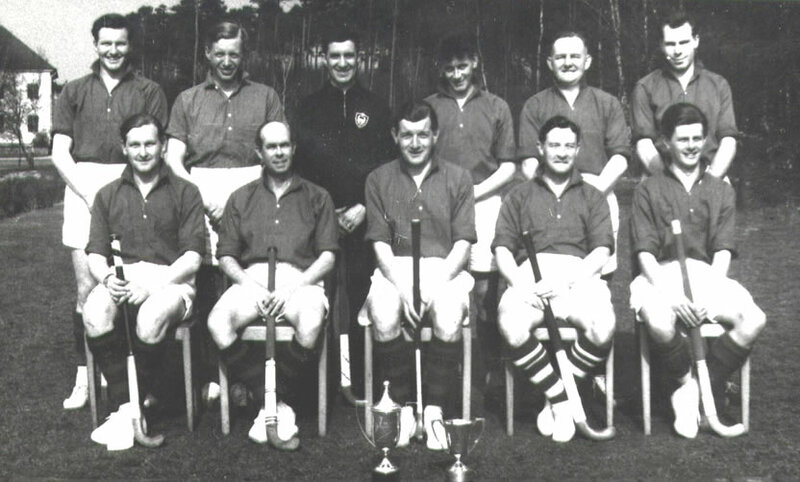 The Regiment was also enjoying much sporting success. 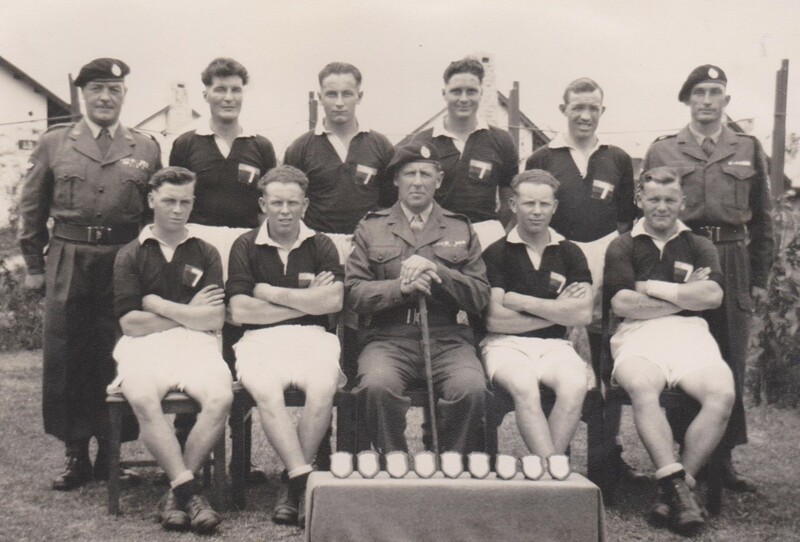 An individual sporting success was achieved by 2/lt Sandy Ferguson. 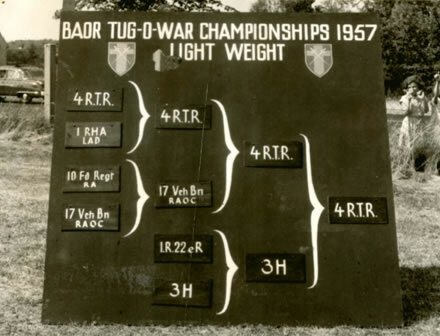 In April 1958 he won the Brigade, and Divisional Golf Championships and went on to become the BAOR Golf Champion, all within his first five months in the Fourth. 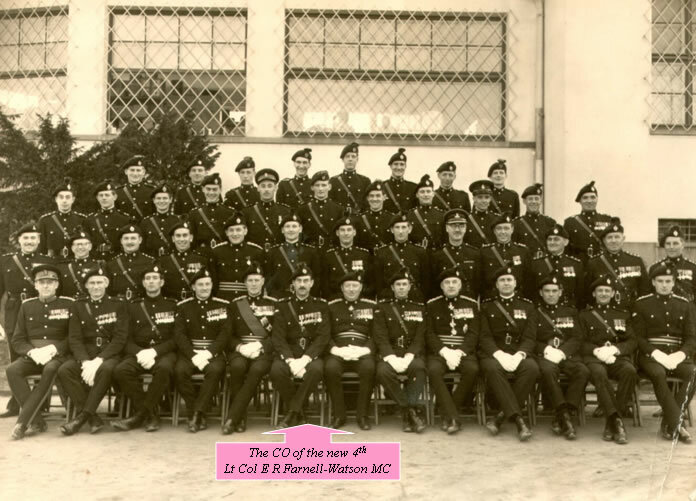 The officers of the Fourth (Lt Col E R Farnell-Watson) August 1958, just eight months before amalgamation. Amalgamations are never easy. But when the Fourth and the Seventh faced a shot-gun marriage they were glad it was with each other. They had fought and died together, been destroyed twice, (once in the counter attacks after Arras and once in the siege of Tobruk), and they each could claim the only armoured VCs in WW 2, both of whom were present. The officers of 4 and 7 RTR at Amalgamation. The inspecting officer was the Representative Colonel Commandant RTR, Major General H R B Foote VC, CB, DSO. 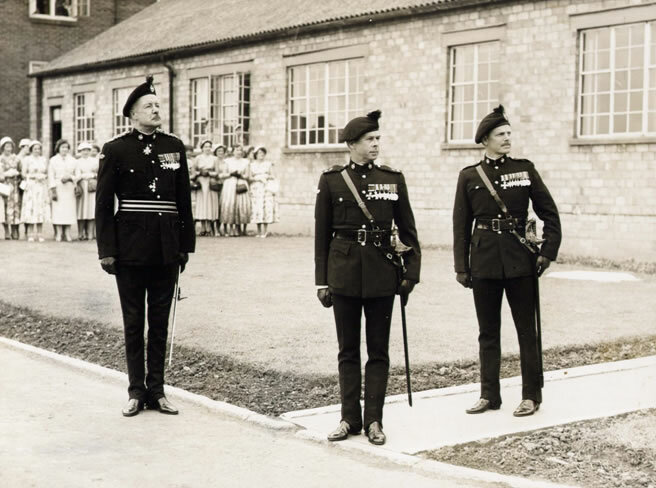 The Colonels Commandant at the Amalgamation Parade, Generals Foote, Crocker and Pyman. 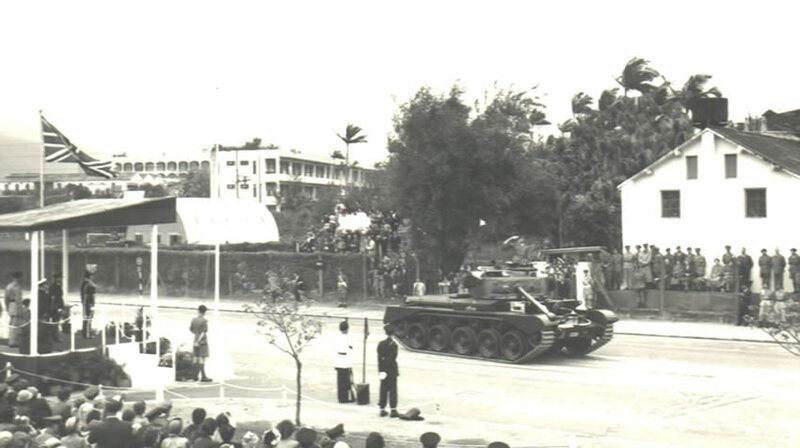 Part of the drive-past during the Amalgamation Parade. 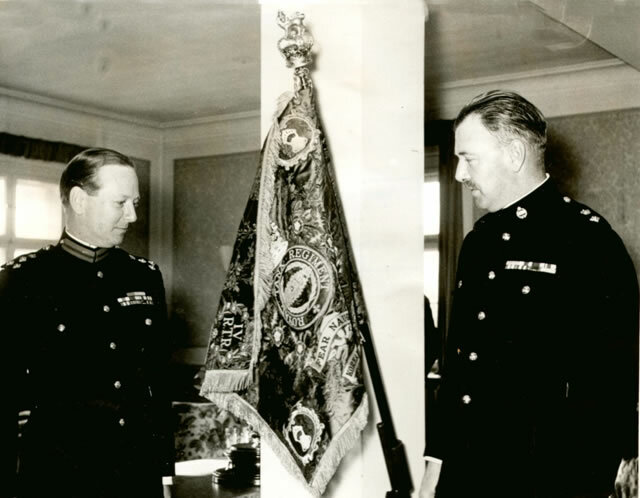 Lt Col Tom Craig MBE MC (right) took command of the regiment in February 1960. The Second in Command was Major Winter Anstey. 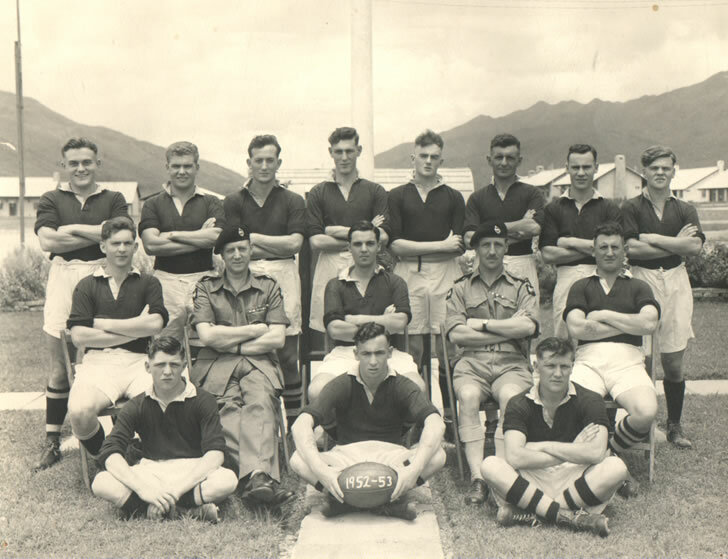 Brigadier Roger StJohn, Commander 11 Bde is in the centre. 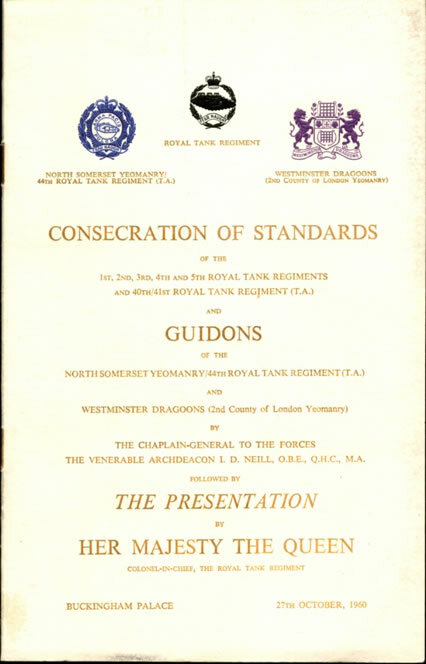 A most significant decision taken in May 1958 was to award Battle Honours to the Regiment and to commission the design of a standard for the regiments, identical except for the individual regiment’s number. Fifteen Battles were selected from World War 1 and fifty four from World War 2. Of these Ten were emblazoned on the Standards including the following in which the Fourth and the Seventh had taken part: Somme 1916, Arras 1917, Cambrai 1917, Hindenberg Line, Rhine, France and Flanders, Tobruk 1941, North Africa 1940-43, North West Europe 1940, 1944-45, Italy 1943-45. 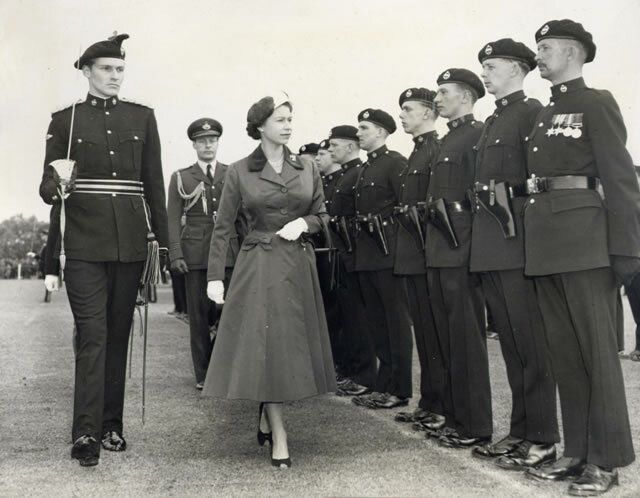 On 27 October 1960 HM the Queen presented new standards to the Royal Tank Regiments at Buckingham Palace. The Colonel in Chief presents the standards. Lt Col T S Craig OBE MC arrowed. The Fourth Party was commanded by Major Anstey. 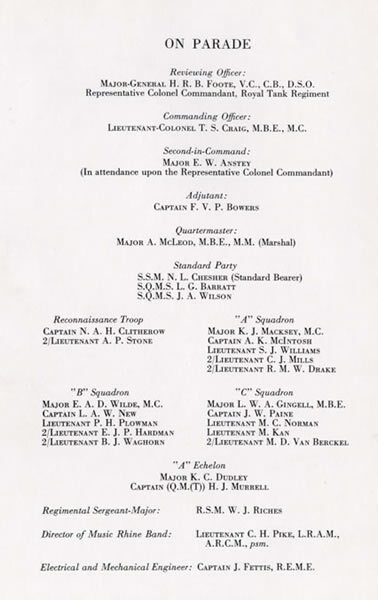 Escorts were Capt N.A.H.Clitherow and Lt E.J.P.Hardman, S/Sgts Walcot and Hornsby, Sgts Smith and Wainright. 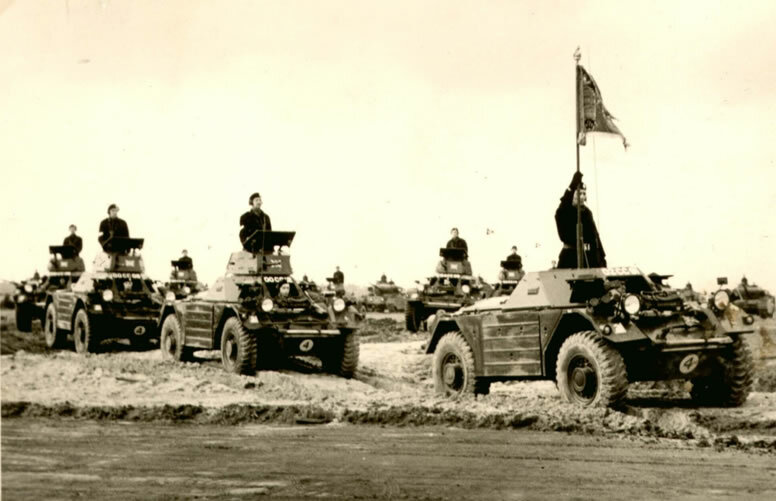 A week later the Fourth held their Trooping the Standard and Farewell Mounted Parade on leaving 11 Bde. 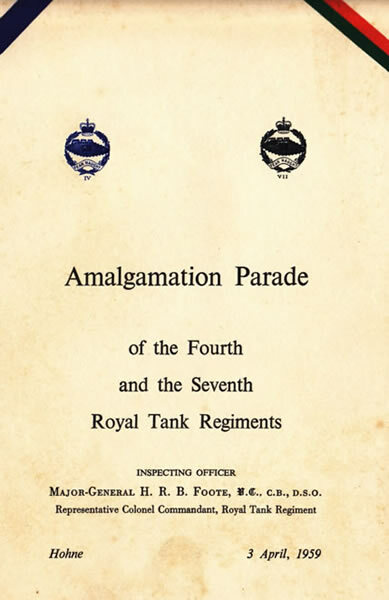 The 4 RTR Mounted Trooping the Colour. Colonel Tom Craig prepares to lead the Regiment past General Foote. Brigadier Tony Hunter, the newly appointed Commander 11 Bde and the Commanding Officer regard the new standard. Over the years both the Fourth and the Seventh had events and postings which drew them towards Scotland. This attraction was formalised when after Amalgamation the Fourth were directed to seek their recruits exclusively from North of the Border. 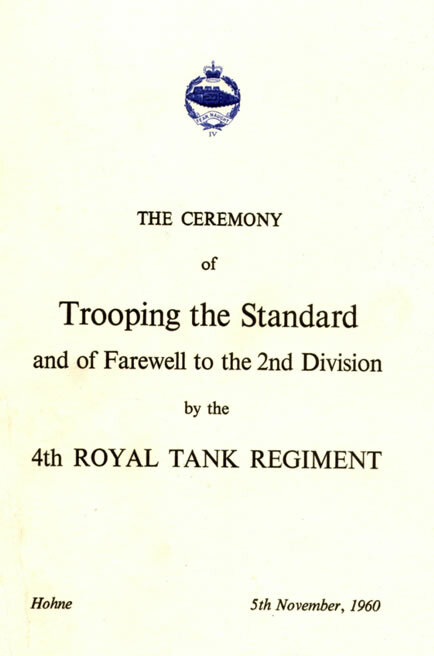 Moreover the TA Lowland Yeomanry was officially affiliated with 4 RTR. 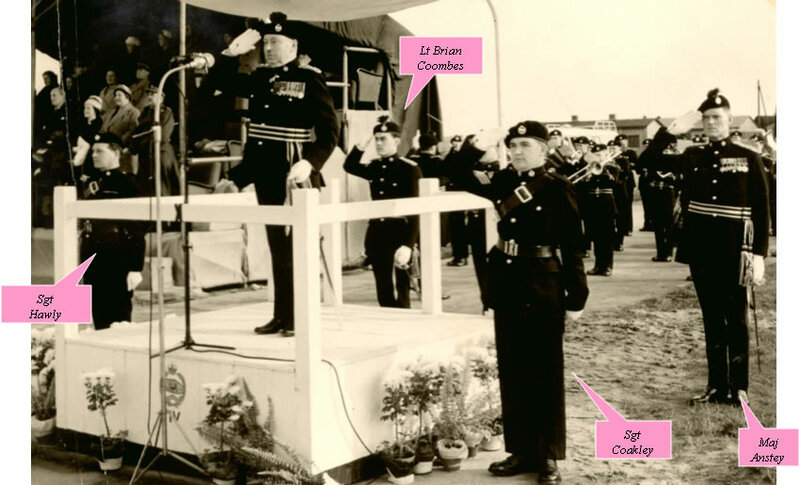 As a small but significant recognition of all this 4 RTR officers wore black brogues in Barrack and No 2 Dress with effect from 5 November 1960. 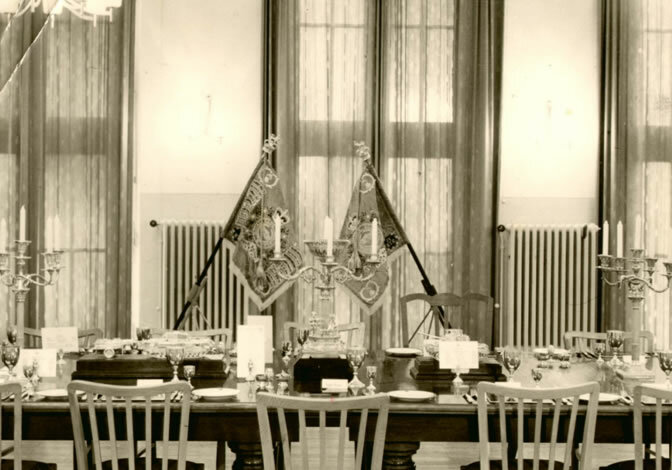 A prescient precedent was set at Hohne on 5 May 1961 when fifty six officers of 1 and 4 RTR dined together . 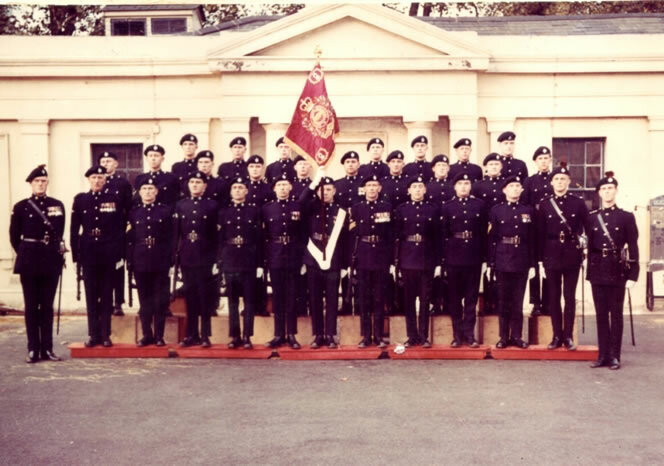 Little did we know that thirty two years later the two regiments would be one. 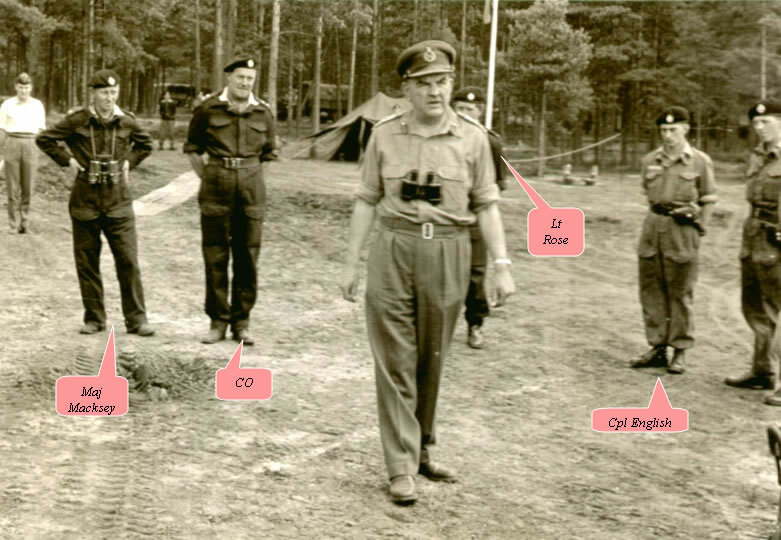 The Corps Commander Lt Gen Sir “Splosh” Jones visited the regiment on Hohne Ranges in May 1961. 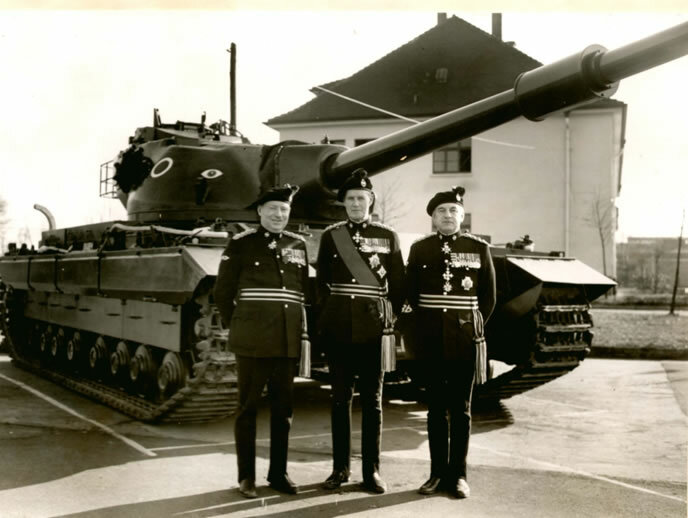 Colonel Tom Craig had only nine months to enjoy commanding a tank regiment in BAOR. Soon the squadrons would be split from Berlin, to Lemgo to Celle. 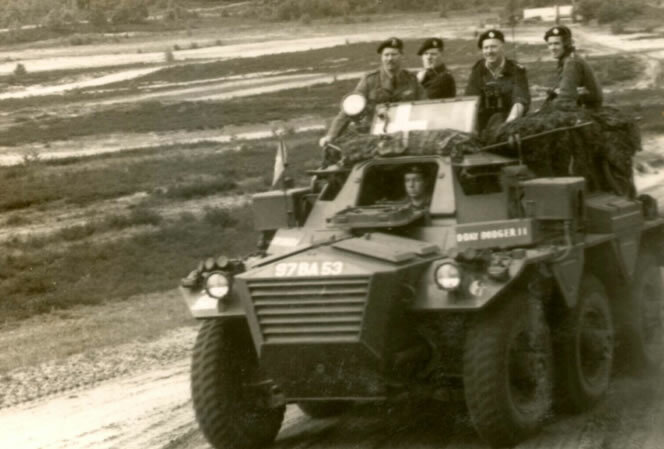 He is seen here in the Regimental ACV, “D DAY DODGER II”. 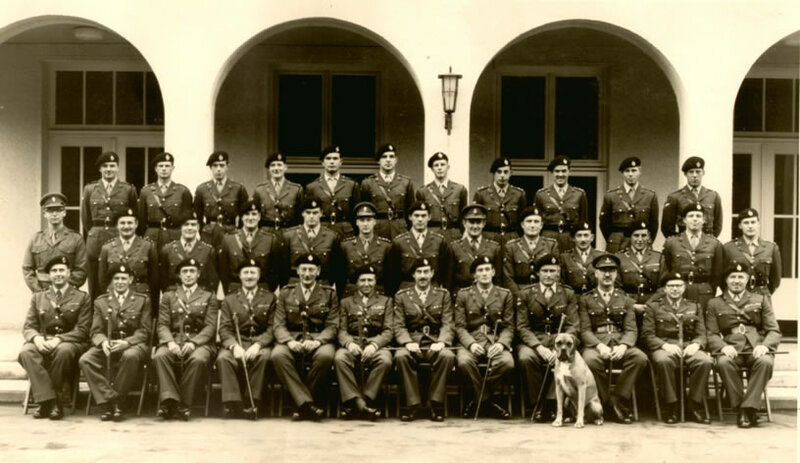 Warrant Officers and Sergeants – Hohne Summer 1961. In the next chapter we see the new Fourth deploy on operations in the Near and Far East.